← Smart Perks State of the State: The Heat is On! 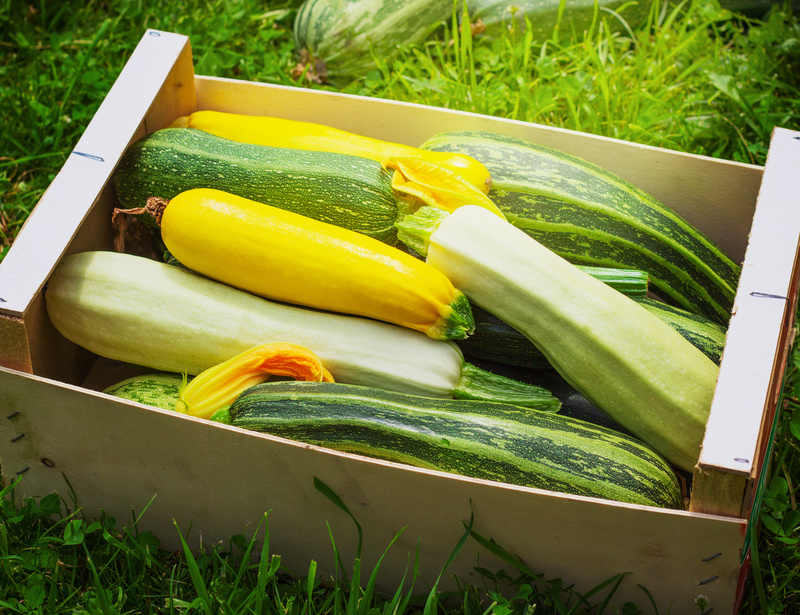 From Garden to Table: Time to Get Your Zucchini On! I love vegetables, especially if they’re fresh from the garden. This year, I can actually say we’ll be enjoying zucchini, cucumbers, green peppers, tomatoes, and sweet corn from our very own garden! After 20 some years without one, it’s about time. I have to give my husband all the credit as he did the tilling, planting and tending. In my defense, he’s semi-retired so he has the time to do it. I don’t. 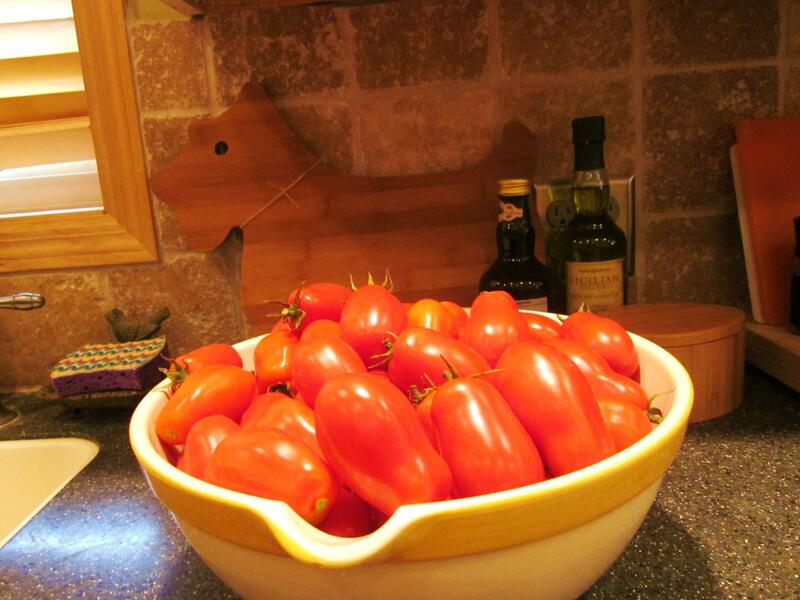 San Marzano tomatoes from blogger Mel B.’s garden last summer. She blanched, peeled, and froze these in Zip-Loc freezer bags to use in sauces throughout the fall and winter. The zucchini and cucumbers, on the other hand, are growing like crazy! In fact, my husband brought in a giant, blimp of a zucchini the other day. My first thought was, what the heck am I going to do with this?! Since I couldn’t exactly use it as a door stopper, I had to come up with other uses for this humongous summer squash. So, I searched online for recipes featuring zucchini as one of the main ingredients, and found the perfect recipe for Chocolate Zucchini Bread on allrecipes.com (see recipe below). I figured as long as there’s chocolate in it, my husband and son will eat it (make that devour it!). Because I had a surplus of the green stuff, I made a double batch. I kept one cake-size pan of it at home and brought a loaf in to work to share. I must admit I’m not much of a baker (I don’t have the patience and usually make a huge mess in the kitchen), but I’m proud to say my zucchini bread was a big hit with both my family and co-workers. 1. Preheat oven to 350 degrees F (175 degrees C). Lightly grease two 9×5 inch loaf pans. In a microwave-safe bowl, microwave chocolate until melted. Stir occasionally until chocolate is smooth. 2. In a large bowl, combine eggs, sugar, oil, grated zucchini, vanilla and chocolate; beat well. Stir in the flour baking soda, salt and cinnamon. Fold in the chocolate chips. Pour batter into prepared loaf pans. 3. Bake in preheated oven for 60 to 70 minutes, or until a toothpick inserted into the center of a loaf comes out clean. This is my own recipe for a super-easy side dish you can whip up using fresh zucchini and tomatoes. Directions: In large skillet, sauté zucchini, tomatoes and onions in hot olive oil for 5 minutes. Add Parmesan cheese and seasoning. Stir to coat well. Serve hot. This is a recipe that Smart Perks blogger Mel B. has been enjoying since she was a little girl. It was her grandmother’s recipe. Directions: Combine dry ingredients with wet ingredients. Pour into 13 x 9 greased and floured cake pan. Sprinkle topping over all. Bake at 325 degrees for 45 minutes. Even if you don’t have a garden of your own, you can find fresh zucchini and other healthy, delicious and home-grown produce at your local farmer’s market. Whether your veggies are the fruits of your labor, or your local grower, enjoy the fresh taste of summer! 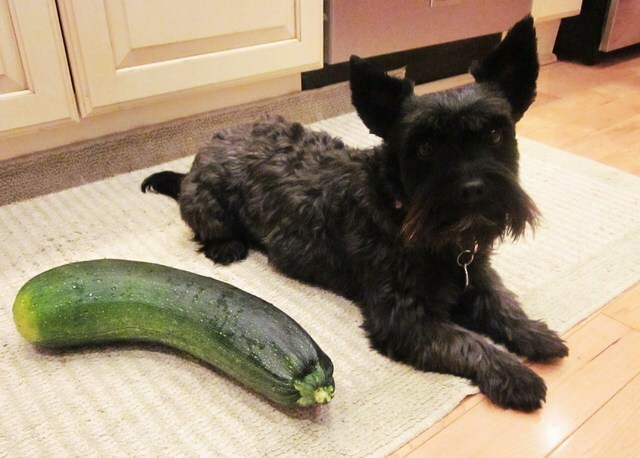 Little dog, big zucchini. Home office dog, Beanie. Smart Perks Blogger, Catherine B, a Smart Perks employee.